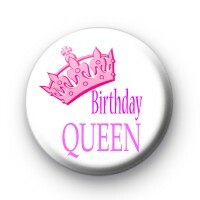 A birthday queen badge in white, with a giant pink queens crown and the words Birthday Queen written in a dark pink font. These badges are perfect if you have a birthday coming up, and you really are the most important person of the day. Standard 25mm button badge hand made in our family workshop. We have a huge range of birthday badges to choose from, so have a browse through our birthday badge category or use the search box to search for your birthday badge designs.